According to Operation World, there were approximately 546 million evangelicals in the world in 2010. These Christians “are largely Protestant, Independent or Anglican, but some are Catholic or Orthodox.” Evangelicals, as counted by Operation World, are those who adhere to or emphasize certain beliefs: regarding Jesus Christ as the sole source of salvation; personal faith and conversion; recognition of the authority of the Word of God; commitment to evangelism and mission. 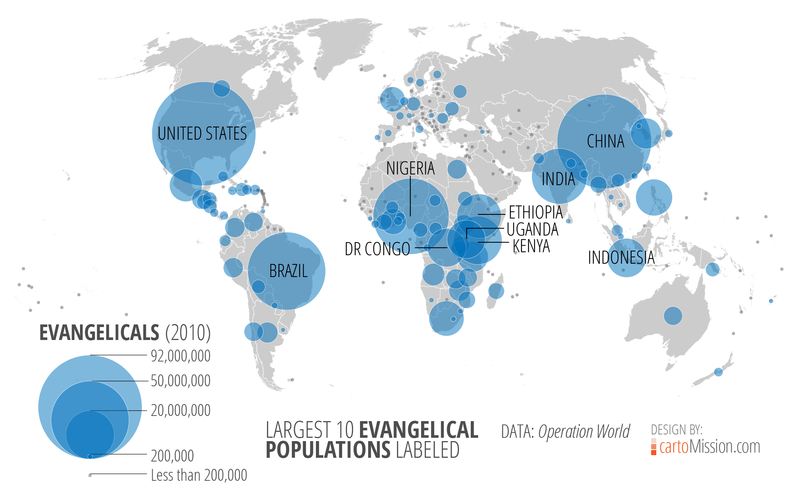 Five of the ten largest evangelical populations in the world are found in Africa. Three countries in the top 10 are found in Asia, and two are found in the Americas.